The original GMC Syclone was a 1991 mid-size Sonoma pickup turned muscle truck. Its heavily modified 4.3-liter V6 sported a turbocharger, intercooler, and modified internals, raising output to a Corvette-baiting 280 horsepower and 350 pound-feet of torque. The engine was paired with a four-speed automatic, rear-biased all-wheel drive, and four-wheel antilock brakes (the coming thing). With an all-black livery and a lowered ride height, the Syclone looked the business, and backed up those looks with a 0-to-60 time of 4.3 seconds and a 13.4-second quarter-mile, according to contemporary magazine testing. Given all the recent interest in high-performance pickups, it's amazing that GMC hasn't revived the Syclone. 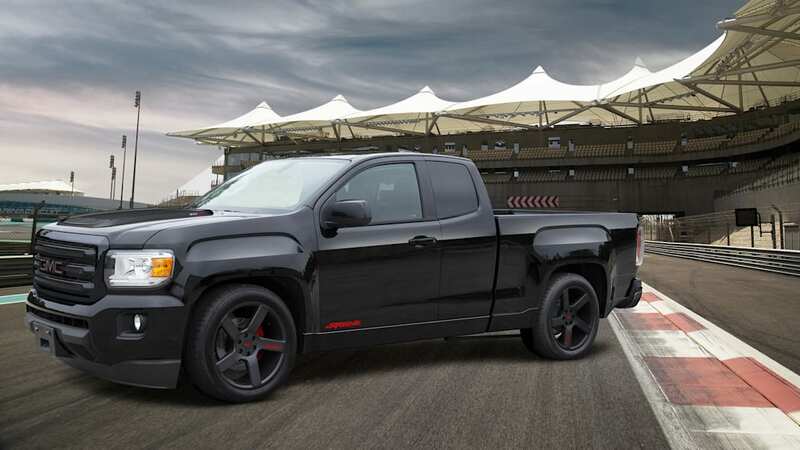 But where manufacturers leave an opening, the aftermarket steps in — in this case that's Specialty Vehicle Engineering, which as CNET reports is resurrecting the nameplate for a build of 100 new Syclones, based on the GMC Canyon, which will update the idea a lot more horsepower. The 2019 Syclone takes as its starting point the extended-cab version of the Canyon. The engine is again a V6, this time a 3.6-liter fitted with a supercharger and a custom cat-back exhaust system, upping output to 455 ponies from the stock 306. SVE's Syclone can be had with rear- or all-wheel drive, and it, too, features upgrades to the brakes and chassis. Six-piston front calipers are fitted in place of the standard four-piston units, and the slotted front rotors are upsized from 12.2 inches to 13.6. The suspension is lowered by two inches up front and five inches at the rear, with stiffer traction bars, bushings, dampers, and a heftier rear anti-roll bar. Unlike the original, the modern Syclone can be had in colors other than black — any of the standard Canyon hues are available — but the appearance is customized with rocker-panel extensions, body-color grille and rear bumper, and a composite hood insert. The interior gets embroidered logos and badges, including a numbered plaque on the dash. The price for the Syclone is $39,995 — that's for the package, on top of the cost of the truck. But at least ordering is easy: The Syclone package can be ordered through select GMC dealers.